Off the conventional safari routes, Zambia and Zimbabwe offer a combined experience of spectacular wildlife viewing, as well as the world’s largest waterfall –Victoria Falls. These former British colonies of Southern and Northern Rhodesia share a border on the Zambezi River, which sustains an incredible assortment of mammals and birds. Expect to see great elephant herds, huge pods of hippo, scores of hoofed mammals and plentiful predators in the three national parks that are the focus of this safari. This itinerary allows you to experience the wonders of two beautiful, less-visited countries. In addition to traditional wildlife viewing on 4x4 game drives, you are also able to enjoy water-based and walking activities, which make this safari especially unique and exciting. One of the Seven Natural Wonders of the World, Victoria Falls is the largest sheet of falling water on earth: over a mile wide as it plunges 350 feet into the Zambezi Gorge. 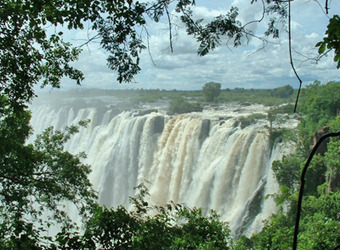 The thundering cataract straddles the border between Zimbabwe and Zambia, churning up a deluge of spray. This is adventure country: see the falls from a helicopter or microlight, raft the rapids, canoe the placid current or enjoy a sunset cruise above the falls. 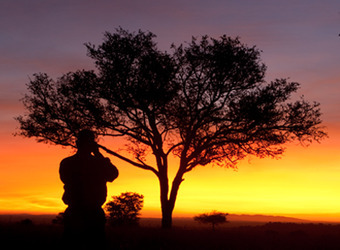 Bordering the Kalahari Desert on Zimbabwe’s western edge, Hwange is the country’s largest national park. Its 5,600 square miles of desert sand, sparse woodland, grasslands and granite outcrops shelter vast herds of elephant, buffalo, zebra, giraffe and a vital predator population, including lion, leopard and cheetah. You may even see one of Hwange's select few resident white rhinoceros. Other endangered residents include gemsbok, brown hyena and African wild dog. Mana Pools lies on the southern bank of the Zambezi River, bordering Lower Zambezi National Park in Zambia. 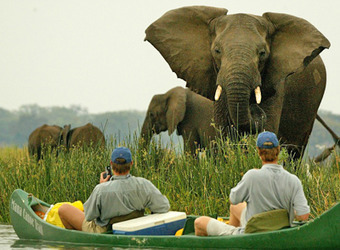 Together the two parks protect a riverine environment that supports an intense concentration of wildlife, ideal for exploring by canoe safari. “Mana” means four in the Shona language, referring to the four large pools, remnants of ancient oxbow lakes, which sustain great numbers of hippo, crocodile, elephant, buffalo, waterbuck and aquatic birds on islands and sandbanks. 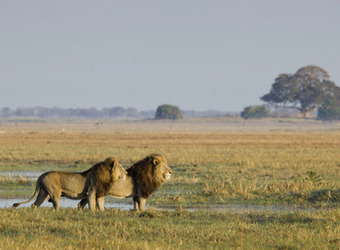 Established in the 1950s, Kafue is the third largest park in Africa. 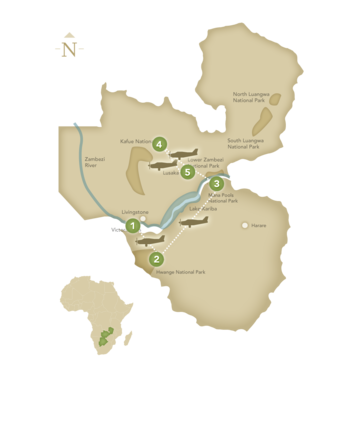 Yet it remains largely unexplored, with 67% designated as wilderness where only walking safaris are permitted. The Busanga Plains are the park’s prized jewel. Seasonal floods generate vast grazing areas for huge herds of buffalo and rare antelope. Kafue is also one of the best places in Africa to see leopard. Lion and cheetah are common, and wild dog are increasingly seen. 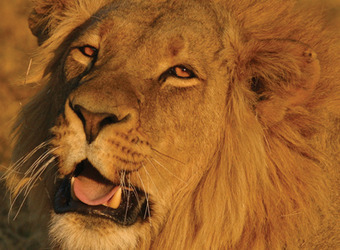 Your safari adventure ends today in Lusaka, Zambia.